Remote Management is a special feature that allows you to view logs and configure the filters remotely from any computer on the same network. 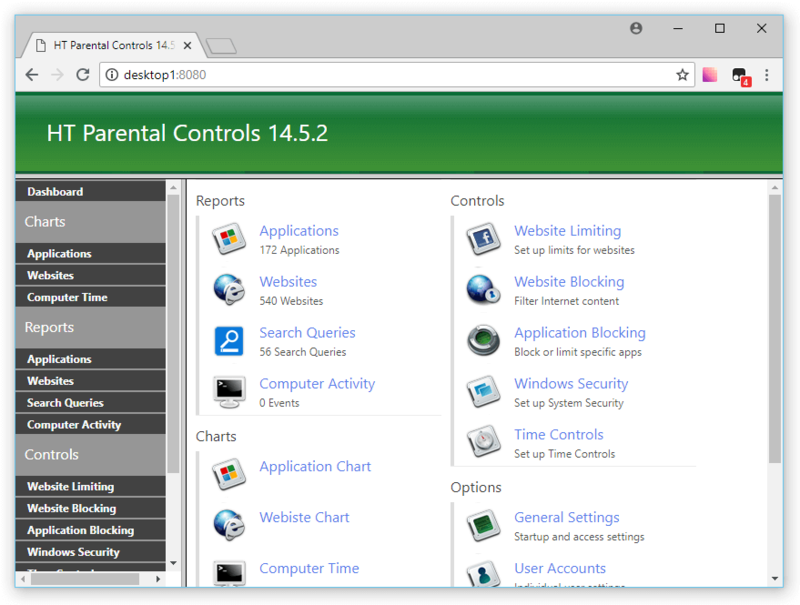 It lets you see all records, set up website and application filters and even start/stop monitoring of your computer(s) from any place in the office. Your changes take effect immediately. The Remote Management is one of many features of our programs - HT Employee Monitor and HT System Administrator. 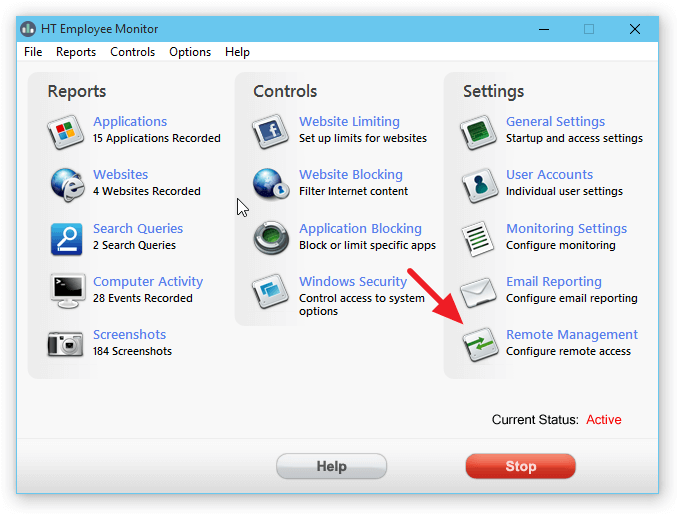 To use the Remote Management feature, you need to enable it locally on the monitored computer and remember its address. 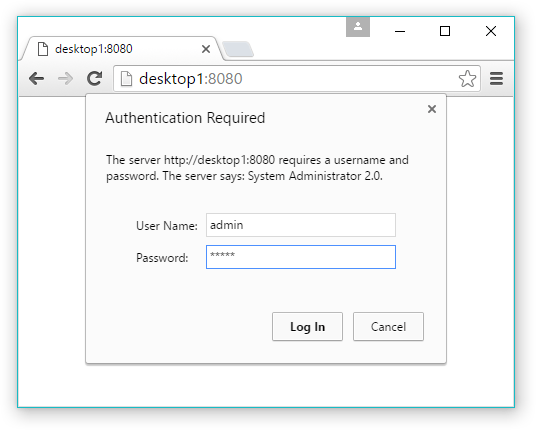 Then open your browser on an admin computer and access Remote Console of a monitored computer by entering its address together with your password. Note! 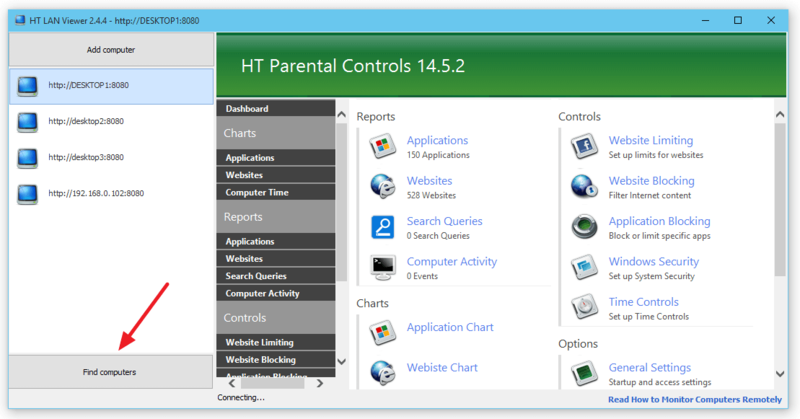 To use Remote Management, install HT Employee Monitor or HT System Administrator on each computer you want to manage. 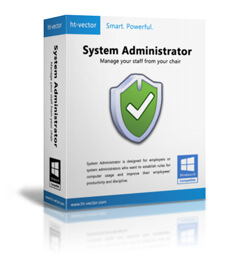 Download and install the software on the computer(s) you want to monitor. Open it and click Remote Management. Click Turn on and remember the URL to access the computer remotely. Pay Attention! Remote Management only works if the software is in the Allowed Programs list of Windows Firewall. If Windows Security Alert appears, click Allow access. http://computer-name:port, where computer-name is the name of the monitored computer, for example, http://JohnPC:8080. Enter your login and password. The default login is admin, the default password is admin. Once you sign in, you will see Remote Console of the monitored computer. Note! You can view the address of the monitored computer on the Remote Management tab. Remember it and use it to access Remote Console. 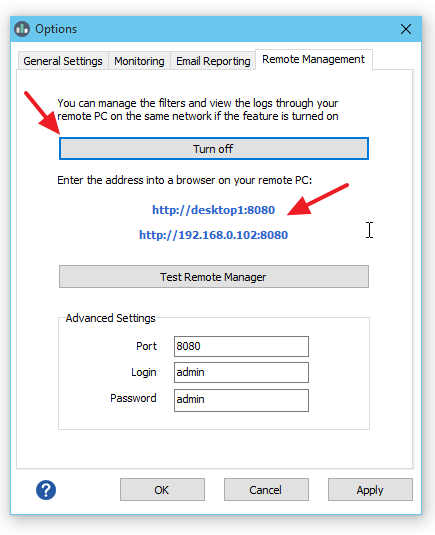 If you cannot access Remote Console of the monitored computer, try changing the address to http://IP-address:port, where IP-address is the IP address of the remotely monitored computer, for example, http://192.168.1.100:8080. That can occur due to the different Windows versions on monitored and admin computers. HT LAN Viewer is a free tool to store addresses of monitored computers and accessing Remote Console. Download and run HT LAN Viewer on your admin computer. Click Find Computers to auto find all online computers with enabled Remote Management on the network. Or click Add Computer to add addresses of your monitored computers manually. Click the computer you want to connect. Open the program locally on the monitored computer and click Remote Management. Enter a new login and password and click Apply. Enter a new port number between 1025 and 65535 in the Port text box and apply changes. Note! If the admin and monitored computers are on different networks, you should use port forwarding to connect to such remote computers. Want to monitor computers that are not on the same network or even far from you? 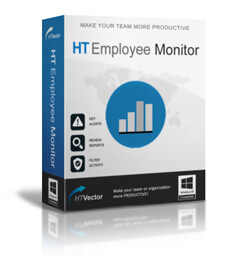 Email Reporting is one more feature of HT Employee Monitor that allows you to receive emails with reports so you can review logs from anywhere you can read your emails.